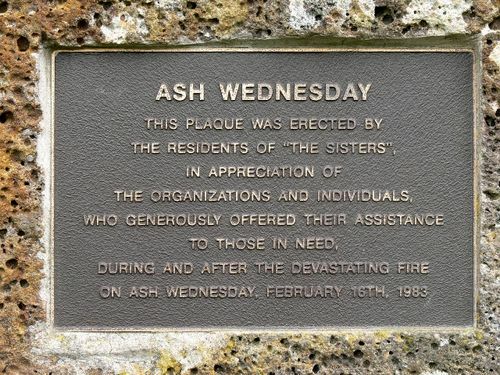 A plaque on The Sisters War Memorial commemorates the organisations and individuals who offered their assistance during the bushfires of Ash Wednesday in February 1983. The Ash Wednesday bushfires, known in South Australia as Ash Wednesday II, were a series of bushfires that occurred in south-eastern Australia on 16 February 1983, which was Ash Wednesday in the Christian calendar. Within twelve hours, more than 180 fires fanned by winds of up to 110 km/h (68 mph) caused widespread destruction across the states of Victoria and South Australia.Years of severe drought and extreme weather combined to create one of Australia's worst fire days in a century. The fires became the deadliest bushfire in Australian history until the Black Saturday bushfires in 2009. In Victoria 47 people died. There were 28 deaths in South Australia. This included 14 CFA and 3 CFS volunteer fire-fighters who died across both states that day. On Ash Wednesday, February 16th, 1983.